Almost every yacht that visits New Caledonia cruises down to the Isle of Pines, known to the yachting community as the Jewel of the Pacific with perfect beaches, clear water, WiFi, great diving and lots of anchorages. 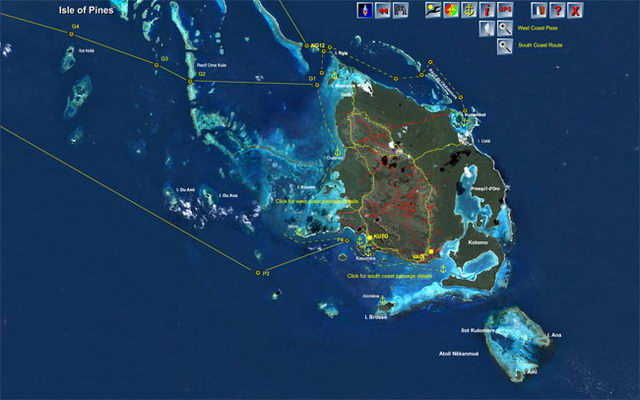 The Cruising Guide to New Caledonia has high resolution photocharts and sailing directions for every anchorage in Isle of Pines. You will see exactly where to anchor with precise sailing directions, GPS coordinates, depths, reefs, nav aids and lights, and even nearby treks ashore, shops and fuel service stations. Navigation chart of Island of Pines from the Rocket Cruising Guide to New Caledonia. In the companion travel guide you will find where to rent a car, available tours, interesting places to visit, the contact details and location of the dive operator, restaurants and accommodations.